GPS on – check. Heart rate monitor on – check. Road clearance given – check. The horn sounded and so did my inner conversation. “I can’t believe the race is here. This is so cool. 16 weeks of injury free training. The time is now. You can do this. Remember what coach said. Run the tangents. Run the tangents. Coach Forty was in my head. Don’t run further than you need to. Protect your space. I did and I did. Up and down the hills I ran and out onto Flatbush Ave. I settled into mile 3 & 4 and ran conservatively. I was really enjoying the race. 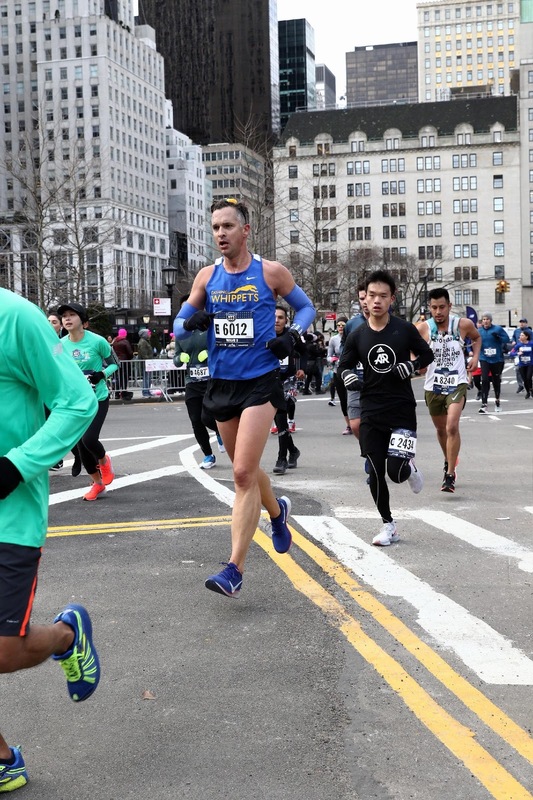 I was excited to be running in a faster corral after a PR at Washington Heights a couple of weeks ago, and it was cool to see my team mates on the out and back. “Let the tide go out, let the tide go out. Don’t panic. You’ve got this. Concentrate and relax.” I was at the Whippet drink station… “Go Hamish, Go Whippets!”. This really gave me a smile and a boost. A quick wave and smile and it was on to Manhattan Bridge. As I approached the top I remember thinking how pretty the water and city look, and how lucky was I to be participating. This city is so cool. Then a BIG freak-out at miles 7 and 8. I’m sure you had one too. As I passed mile 7 my watch said I ran 1 minute behind pace. “What, what, WHAT? What the heck happened? Did I fall a sleep? My body is numb from the cold. But come on. Surely I’ve not lost touch with reality. By the time I got to Mile 9, the panic had gone… did anybody else summize that mile 7 & 8 were 2.5 miles and mile 9 was only 0.5? As I entered 42nd I heard the cheer from Whippet Brett Slater. Thanks Brett, you got me up the 42nd St incline. 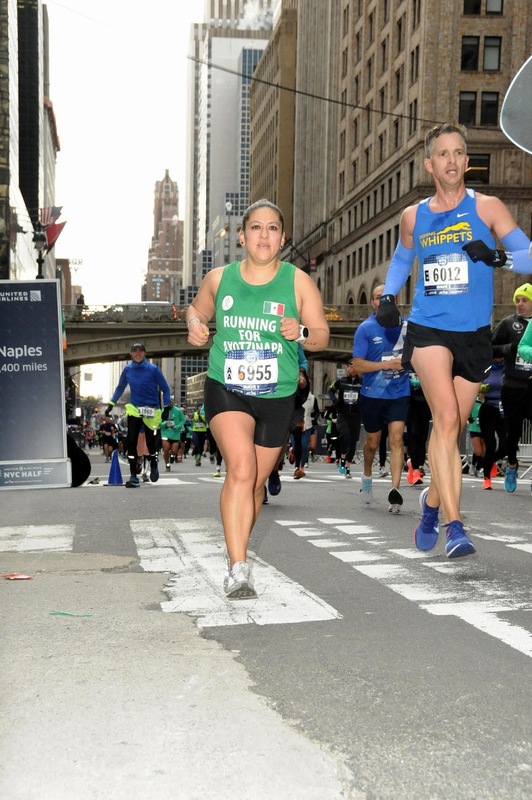 My legs did not let me down, I raced toward the 72nd St transverse, past the Mall and toward the final hill. I could see the 200m to go sign. When I saw the 200m sign I heard the speaker say “here comes the 1:40 group.” Holy heck. I’m going to do this. I’m going to smash my PR. I could see the finish line. 1:40 displayed on my watch. 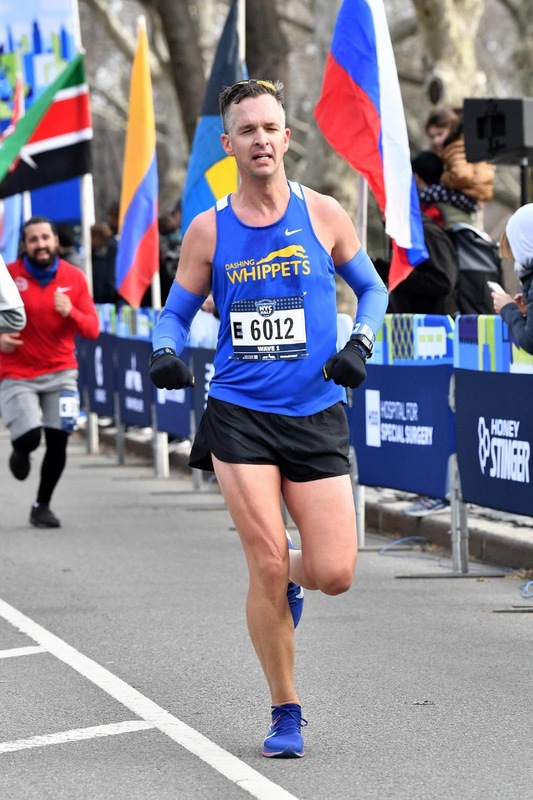 As I approached the finish line the announcer said “here comes a Dashing Whippet, finishing strong” I said to myself “I AM A WHIPPET. WE DO FINISH STRONG. DROP IT! 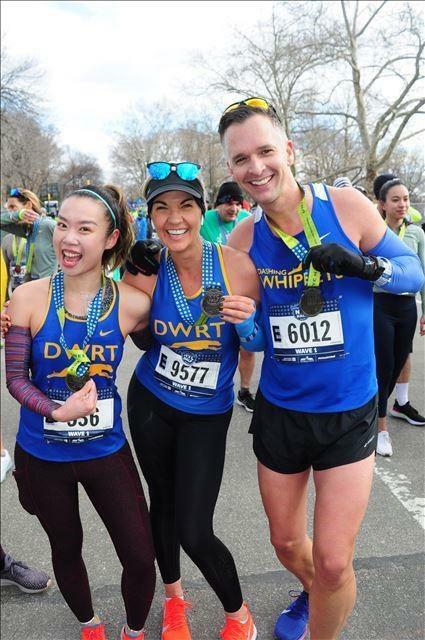 It felt AH-MAY-ZING to cross the finish line and even better to celebrate the race with my teammates. I dared to dream 6 weeks ago that I could run a sub 1:45. I ran a 1:40 (14 minute PR). Now I am looking at the 2019 race calendar and wondering what is possible if I dream further. Can I run myself into a faster coral? Is a BQ possible? Maybe, maybe not. I’m going to have a good crack at it.